Geoff Beattie is Professor of Psychology at EHU and a Masters supervisor on the Sustainability Leadership programme at the University of Cambridge (2013-14). His research focusses primarily on embodied cognition/multi-modal communication and applied social psychology. The research on multi-modal communication offers a major reconceptualization of bodily communication, by focussing on the close connections between gestures, speech and thinking in linguistic generation (‘Visible Thought’, 2003; ‘Rethinking Body Language’, 2016). The applied social psychological research focusses primarily on implicit cognition, especially implicit attitudes and their effects on behaviour, in the context of the environment (‘Why Aren’t We Saving the Planet: A Psychologist’s Perspective’, 2010) and race (‘Our Racist Heart: An Exploration of Unconscious Prejudice in Everyday Life’, 2013). In the past year, he has presented his research on why we need to target implicit, automatic associations in the fight against climate change at the United Nations Conference on Climate Change, UNESCO Headquarters, Paris, in July 2015, and acted as an external contributor to Unilever’s Leadership Vanguard. He has also given a number of keynote addresses on implicit racial bias at various high profile conferences throughout the U.K. He was Professor of Psychology at the University of Manchester (UoM) from 1994 to 2012 and Head of Department then Head of the School of Psychological Sciences from 2000 until 2011. He was Research Group Leader of the ‘Language and Communication Research Group’ (2004-2011), and a Professorial Research Fellow in the Sustainable Consumption Institute at UoM from 2008-2012. He was also Visiting Professor at the University of California Santa Barbara in 2012. He has published 20 books on a range of topics (including one semi-autobiographical novel ‘The Corner Boys‘, Victor Gollancz, 1998) many of which have either won or been shortlisted for major national or international prizes. His books have been translated into Chinese, Taiwanese, Korean, Portuguese, Italian, Finnish and German. He has also published over one hundred academic articles in journals including Nature, Nature Climate Change and Semiotica. He is a Fellow of the British Psychological Society (BPS) and was awarded the Spearman Medal by the BPS for ‘published psychological research of outstanding merit’ for his work on nonverbal communication. In 2010, with a number of colleagues he was awarded the internationally acclaimed Mouton d’Or for the best paper in the leading international journal Semiotica for research on the effects of deception on gesture production. Professor Geoff Beattie became a Fellow of the Royal Society of Medicine in 2016. His research has been funded from a range of sources, including research councils (ESRC; British Academy), the EU FP7, charities (Leverhulme Trust; Nuffield Foundation; Equality Challenge Unit) and from commercial sources like Tesco and Unilever. He has always been keen to show the relevance of psychology to society in general and in 2005-2006 he was President of the Psychology Section of the British Association for the Advancement of Science. 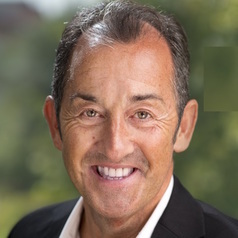 He is well known for bringing analyses of behaviour, and particularly nonverbal communication, to a more general audience by appearing as the on-screen psychologist on eleven series of Big Brother in the U.K. and for explaining how psychology can be used by people in their everyday lives, for example, in the international bestseller ‘Get the Edge: How Simple Changes Will Transform Your Life’ (Headline). He has presented a number of television series including ‘Life’s Too Short’ (BBC1), ‘Family SOS’ (BBC1), ‘The Farm of Fussy Eaters’ (UKTV Style) and ‘Dump Your Mates in Four Days’ (Channel 4). He has also appeared as an expert commentator on BBC News, Russia Today, ITV News, CNN, Sky News, BBC News 24, BBC World Service, News Asia, GMTV, Channel 4 News, Channel 5 News, BBC Breakfast, Good Morning America, Tonight with Trevor McDonald etc. His radio interviews include the Today Programme, Woman’s Hour, Science Now, All in the Mind, Word of Mouth, Freewheeling and Midweek (all Radio 4), Nightwaves (Radio 3), Parkinson on Sunday (Radio 2), BBC World Service ‘World of Books’ programme, ‘This Week’ (RTE), Canadian Broadcasting Corporation and many local radio stations. In addition, he has carried out media work on behalf of a range of organizations, including ITV, Universal Pictures, Department for Work and Pensions, NHS, Nivea, Royal Mail, Disney and the Foreign and Commonwealth Office. He has given numerous keynote addresses to both academic and non-academic audiences including Unilever, P&G, ITV, HSBC, Tesco, Marketing Forum, PricewaterhouseCoopers, Annual Conference of High and Supreme Court Judges in Ireland, Marketing Society, Equality Challenge Unit, Malaysian Olympic Association, British Council, Samaritans and the Central Office of Information, and written extensively for the Guardian, the Observer, the Observer Magazine, the Independent, the Independent on Sunday and The New Statesman, as well as contributing to Granta magazine, over a number of years.